lived at four addresses in the Bronx, my mother at only one more. 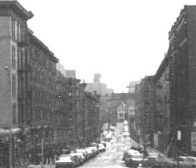 My grandparents, mother and aunt lived on 167th Street at Teller Avenue. Next door was Breedan's Ice Cream Parlor. My grandmother and her neighbors helped each other get through the years of the Great Depression. They shared food, money and clothing, held block parties and Sunday suppers. The friendships forged during these times lasted their lifetimes and the children also remained friends for life. I grew up with "aunts" and "uncles" who were not related to us, but were so close and deserving of the title of respect. When my parents married, the entire family moved to a larger apartment at 380 E. 166th Street, next door to Sheffield Farms. I came home from Bronx Hospital to that apartment. In 1945 we moved from our fifth floor walk-up to a second floor apartment at 1108 Findlay Avenue. This is where I grew up, played games in the street and on the stoops, went to P.S. 53 and St. Angela Merici Church, went to the playground on Morris Avenue, the cafeteria on 167th, the Kent and Fleetwood movie theaters, and Yankee Stadium. My best friends were White, Black, Jewish, Catholic, Protestant, Irish, German and Italian. Shops and stores lined both sides of 167th Street, and Saturday mornings found us at Pfeiffer's Butcher, LaRosa's Vegetable Store, the German bakery, drugstore and Breedan's. I remember milk delivery, a vegetable wagon, awnings and flags from every window, the "line-up man" who restrung your clothesline, and taking special occasion photos inside the gates of the Daughters of Jacob Hebrew Home for the Aged. There were trees, flowers and benches in a lovely setting. My mother remarried and the three of us moved up the block to 1134 Findlay. From here I went to Jordan L. Mott JHS 22, was a member of the Bronx Bombers wearing a white sweater with purple letting, learned to dance, sat on the fire escape, rode the Webster Avenue bus to Fordham Road, attended my first prom and fell in puppy love. From my mother's bedroom window she could see the bedroom she shared with my aunt for 25 years. She had come full circle around the block. Three generations of my family had wonderful memories and lasting friendships from a great neighborhood in the Bronx. In 1958 my mother and stepdad bought a house and we moved out of the old neighborhood; my grandmother, aunt, uncle and cousin stayed a few years longer. I drove down Findlay Avenue only once after I moved out of New York City, and that visit was over 30 years ago. I don't believe I will drive there again, as I'd like to remember it the way I do remember it. Copyright ©2006-2019 SofTech Consulting, Chappaqua, New York, USA All Rights Reserved.